You may have noticed that gorgeous, natural wood is a signature element of the Room & Board look. For our 2016 collection, we introduced a new (for us) wood—ash—in two new stain colors: sand and bark. Today we’re talking about the inspiration for our bark stain color and how to use it in your own home. Hint: it’s easy. To say this new stain color was inspired by nature sounds cliché, but it’s true. Our goal was to create a color that looked like the bark of a California oak tree. A little grey, a little brown and the slightest hint of green and red. We chose to apply this stain color to ash because of the sweeping, dense grain pattern that we think actually looks like the bark on the tree that inspired us. Wood experts/lovers/nerds like us refer to this as a cathedral grain pattern—dramatic arches reminiscent of (not surprisingly) a cathedral. Here are three ways to use this new color in your own home. White walls and light floors are everywhere these days, and if that’s your look, you’ll love how bark adds contrast and keeps things balanced and grounded in a light, airy space. The Calvin bed and dresser in bark brings contrast to this light and bright bedroom. If you don’t have much pattern or texture in your room, a dramatic grain pattern and color adds needed depth. Any wood with a visible grain pattern can help you do this, but bark stain on ash is particularly rich and inviting. 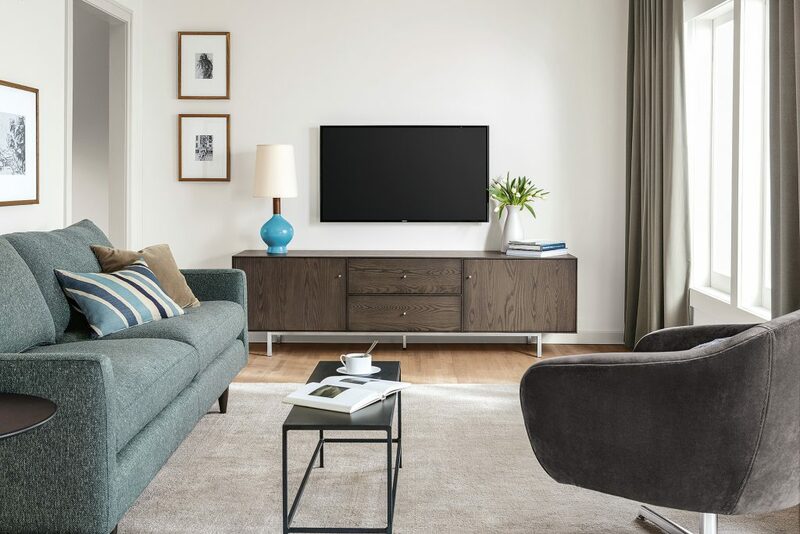 The prominent grain pattern and smokey color of this Hudson media cabinet adds texture and depth to the solid colors in this living room. 3. For the evolving room. One of the many reasons we love the bark stain is its ability to mix with cool or warm colors—it doesn’t lock you into one color palette. If you love to change things up, you’ll find that bark can play with grey and blue just as well as it can with brown, red and green. A Calvin bed and nightstand in bark looks at home with warm, creamy colors and pops of red. 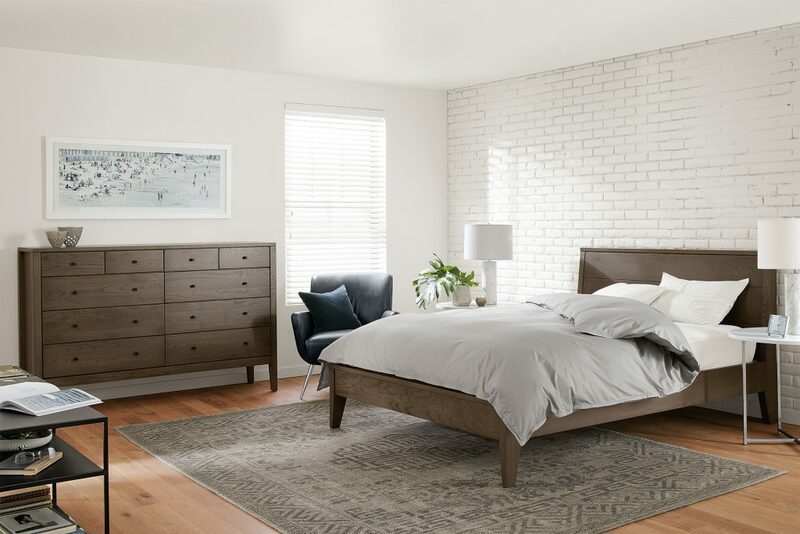 Ash with bark stain is available on the Calvin and Hudson bedroom and storage collections, which you can see in our stores and online. can you send a “bark” color to me to choose from? Its very difficult to choose the color from a computer screen. I’ve purchased several items with the ash bark stain, and am wondering if you sell small bottles of the actual stain for touch-ups? We do offer touch-up pens that match our Bark stain color, which you can order over the phone at 800.301.9720. They’re $8 and perfect for filling little scratches or imperfections.